The needlework is precise and very well done on these stays - a geometric wonder! 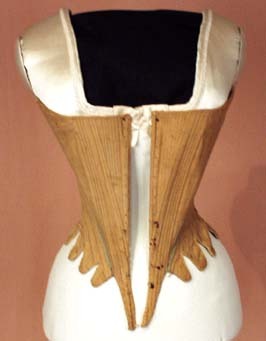 Stays from this period were sometimes sewn together in the front and laced close in the back. To see nearly identical stays (dated 1775), please refer to pages 47 & 49 of The Kyoto Costume Institute's exhibition book, Revolution in Fashion, 1715-1815.